It’s the evening of October 4th. Over the last 2 days we have had excellent efforts by different sections of our team on the Lhotse face, on the climb all the way up to the 23,700 ft. (7223m) location of our Camp 3. Now as you know right after those storms there were avalanches as well as a lot of snow accumulation. As it turns out we lost the bottom 600m (1,970 ft) of fixed line on that route leading up to the Lhotse face and the top 400m (1,312 ft) was intact. It’s all been replaced now as you know. The fellows who have come to call themselves Team Canada, Bryce Brown and Michael Boni along with Danuru and Mingma Ongel climbed all the way to Camp 3 yesterday. Michael said that it was quite a challenge but he kept repeating ’34 bucks a foot, 34 bucks a foot’ which is the amount he is trying to raise for the Make a Wish Foundation. 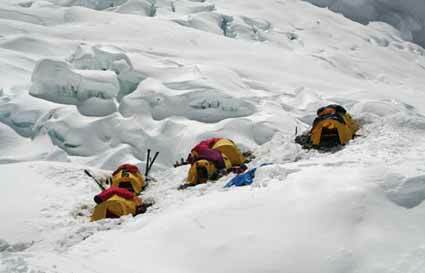 They did a great job reaching Camp 3 afterwards returning to Camp 2. Today the weather changed as Dave, Kit Rob and Jimmy made their climb up the Lhotse Face to Camp 3. 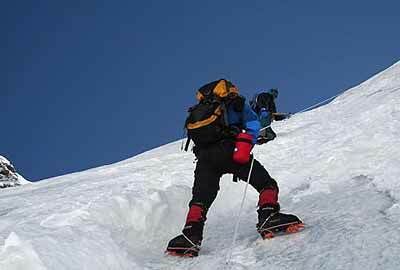 There was strong SW winds blowing right across the Lhotse Face and into the SW face of Everest. Teams are all back at Camp 2 and for now we continue to monitor the weather closely. That is the update for today, we will continue to keep you posted.